Sketch Challenge #124 over at Splitcoast was so interesting, I've made three so far. The first one I did was for my grandmother, but the picture was so awful I don't want to post it here, and since I don't have it anymore, I can't reshoot. But since then I have made two others that came out better anyway. The best way to go about doing this sketch is to start with your scrapbook paper cut at 3 3/4" by 5". Flip it over to the back, and make a mark on one short end 1/2" from the top and from the bottom. On the other short end, make a mark 1 1/4" from the top and from the bottom. Connect the top mark on one side to the bottom mark on the other side, and do the opposite going the other way to make an X. Cut apart on these lines, and you have your two triangles! I matted these triangles 1/8th " on the two long sides of each triangle, with the short side flush. Then on a 4" x 5 1/4" panel I centered the triangles facing each other. There is a slight overlap which you could trim, but since you will be covering it with your focal image, it doesn't really matter. This panel is then attached to a regular size card base (4 1/4" x 5 1/2"). I hope this makes sense. 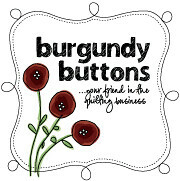 The card below was made using Tempting Turquoise and Chocolate Chip cardstock, to go with the scrapbook paper I got in the Die Cuts With A View 4x6 Retro pad. The turquoise panel is Cuttlebugged using the "fabric" Fiskars Texture Plate, and attached to a Choco Chip card base. 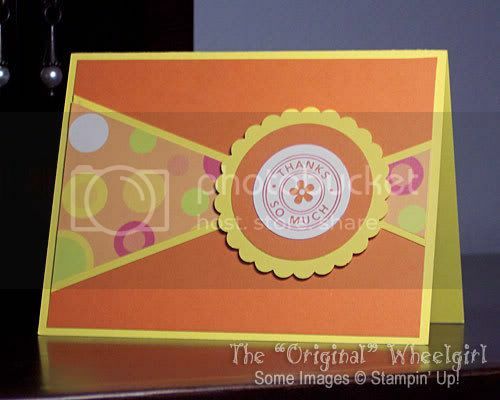 The focal image is made using the flower and Thank You background stamps from the Mini Messages set by Stampin' Up! I used Tempting Turquoise ink for the flower and Chocolate Chip ink for the background Thank You's on Whisper White cardstock. I punched this image out using my 1 1/4" square punch and matted it with a Marvy Mega scallop square in Chocolate Chip. I attached the focal image using dimensionals. I just love this color combo! This won't be the last sketch like this I'll do, but I like this week's sketch too, so maybe I'll have to move on for a while...LOL!